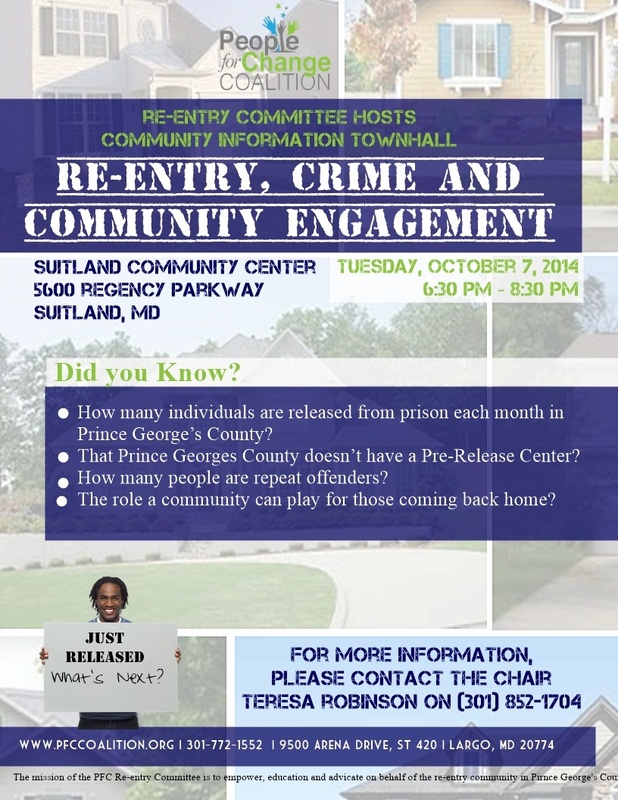 The Re-entry Committee held a town hall on Tuesday, October 7, 2014 called "Re-entry, Crime, and Community Engagement" with over 80 people in attendance. The facilitator was Caryn York, Policy Associate for JOTF, and the panel included Willie Clements of the Prince George's Dept. of Corrections, Re-entry Service, Matthew Fogg, Retired Chief Deputy US Marshal, and Dr. Gail Parnall, Executive Director of OAR. (a) bring more awareness to the needs of the re-entry population in Prince George's County (such as centralized resources, band the box legislation, employment, and the need for a pre-release center). (f) share information on how to start an effective re-entry program in Prince George's County. PFC Coalition is looking at strategic partnerships with OAR.